Kookaburras are native Australian Forest birds they have short, thick bodies, large heads and long bills. Their feathers are brown, black or white. There are blue patches on some of the feathers. Males and females look similar. And again, posing nicely on a branch too! Did you hear him 'laugh'? In German, we call him 'Lachender Hans' (Laughing Hans) - it is amazing. In England we call him ' the laughing jackass' good shot!. These birds are so cute, in French they are called martin-chasseur géant. 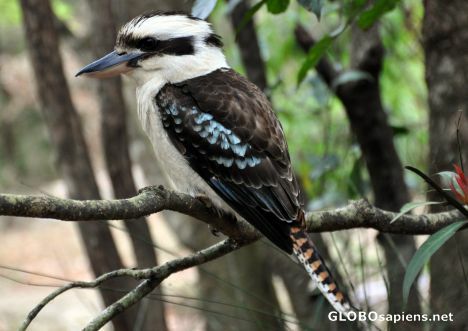 "Kookaburra sits on the old gum treee, merry merry king of the bush is he; laugh Kookaburra, laugh Kookaburra. Gay your life must be." Amanda, this was a song when I was little! Everytime I hear Kookaburra, I think of this song which is exactly the same as your nursery rhyme. BTW, this is a great pic of a little bird with a big laugh!